When John Carlos raised his fist in the iconic Black Power salute at the 1968 Olympics in Mexico City, it wasn’t just a moment, it was a movement. “What happens if they shoot us?” asked Tommie Smith, as they prepared to take the podium, a valid question because of the recent assassinations of African-American leaders such as Martin Luther King Jr. and Malcolm X. It was nearly a half-century ago when the sprinters raised black-fisted gloves during the playing of The Star-Spangled Banner at the 1968 Games. Both wore black socks and no shoes to represent African-American poverty, and beads to protest lynching, causing a ripple effect that would change the world of sports forever. Carlos, who continues his social activism around the world, was part of a discussion titled “Power, Race and Patriotism” on Friday night in Winston-Salem, North Carolina, moderated by Melissa Harris-Perry, a Wake Forest University professor of politics, and Dave Zirin, The Nation’s sports editor, with whom Carlos co-wrote The John Carlos Story: The Sports Moment That Changed the World. 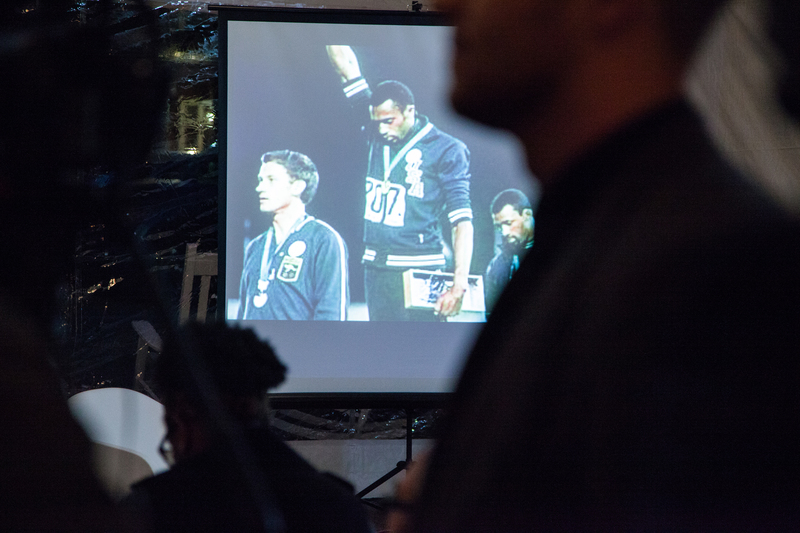 An iconic image of Dr. John Carlos is seen projected on to a screen at an event held in Winston-Salem, NC on October 14, 2016. The event was small and personal, held in a tent where the topic of gender and race in the Olympics, was held. Carlos and Smith were banned from the U.S. Olympic team and ordered to leave Mexico. They faced death threats and disgrace when they returned home. The country has come a long way since 1968 and yet the question remains: Is there a place for activism in sports? The answer is muddled in loyalties and money-motivated agendas. As an athlete, advocating and espousing one’s beliefs can come at a grave price with endorsements and careers on the line, but it’s one well worth paying, Carlos said. In an age when the term “athlete” is sometimes interchangeable with “hero,” it’s the responsibility of athletes to use their star power to incite change, Carlos said. The question of how that can be done relies on taking action, regardless of the consequences. The Summer Olympics always coincide with the U.S. presidential election, making it a good platform for political activism and one that should be utilized more in the future, he said. If the Olympics happened after San Francisco 49ers quarterback Colin Kaepernick took a knee during the national anthem, it would have been a different story. While Kaepernick’s kneeling during the national anthem is enough to needle critics and incite conversation, he continues to play and his message might not pack the same punch. But if Kaepernick were to boycott, he could easily be replaced, a dilemma many athletes face. The more people who band together to create change, the greater the impact and the lesser the consequences, Carlos said. University of Missouri football players may have found that sweet spot last year while protesting former university system president Tim Wolfe’s dismissive approach to the racism that was poisoning that campus. Attendees watch on as Dr. John Carlos answers a question asked by one of the audience member at a discussion on race and gender in the Olympics, in Winston-Salem, NC on October 14, 2016. 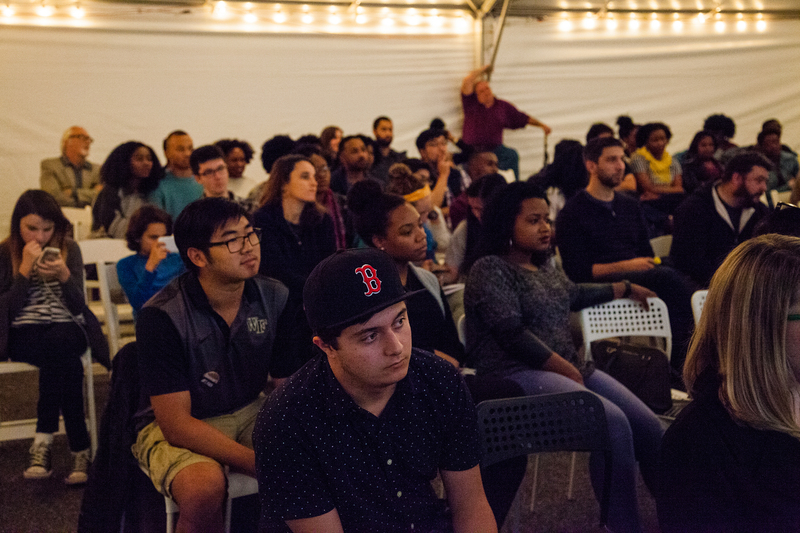 The event was held in a tent where attendees where able to speak with Dr. John Carlos and had the opportunity to ask questions during a Q&A segment. After a hunger strike and student protests failed to produce results, 30 of the school’s football players threatened to boycott and not play, prompting a hurried resignation by Wolfe. Carlos said lies circulated for years about his Olympic bronze medal being revoked, but that was just to intimidate younger athletes into not following in his footsteps. Carlos called for a more universal movement regardless of ethnic background. So, how can athletes prompt change without jeopardizing their careers?